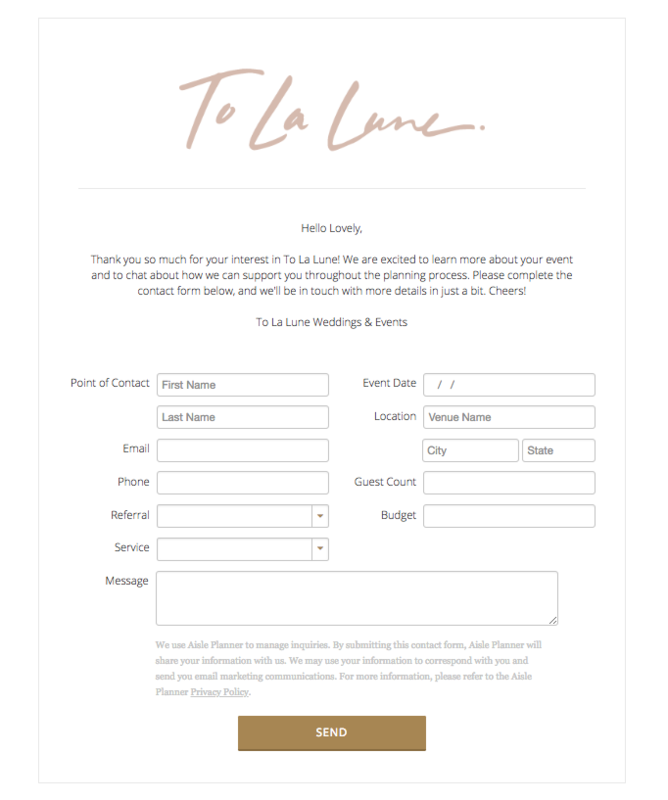 Aisle Planner's Lead Contact Forms are easy to set up and put your booking process on the road to automation. Here are the steps! We know you’re excited to dive right into customizing your Lead Contact Form but, we want to be sure that your lead manager is set up to maximize its potential for you and your business when used in tandem with your lead contact forms, so this is where to start. 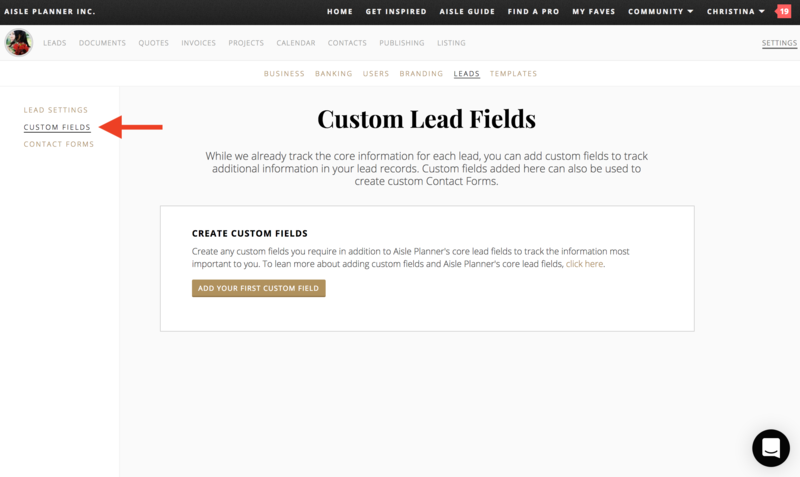 While we already include fields to track core information for each lead, you can add custom fields to your lead records so that you can track any additional information that's important to you - if you plan on creating custom contact forms to request additional information beyond our core fields, you'll want to take some time to set up your custom fields here. If the core fields are enough, skip on down to Step 3 below, but if you'd like to set up your custom fields, click on the Custom Fields tab to the left side of your Lead Settings. We'll walk you through the basics in this short tutorial. After you've configured your settings and have set up your custom fields, you’re finally ready to set up your Lead Contact Form. We'll walk you through each step in this short tutorial! 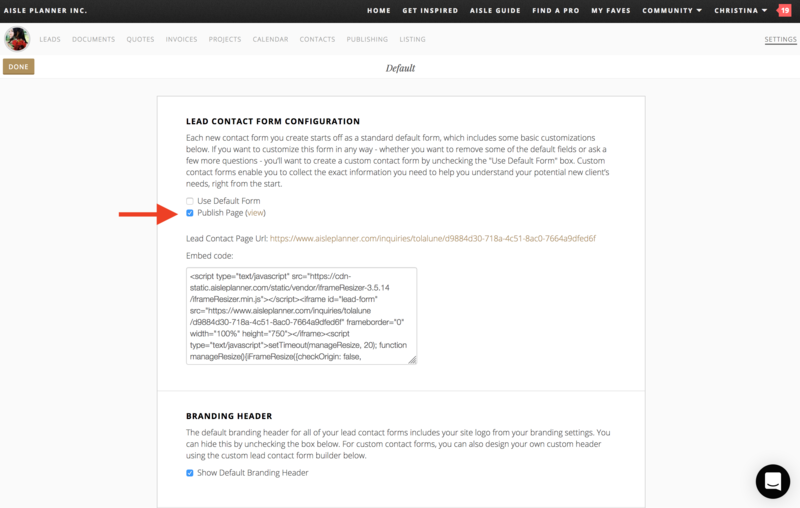 To publish your Lead Contact Form, simply check the box next to “Publish Page” when you are ready. Uncheck that box to un-publish your Lead Contact Form at any time. To put your lead capture form on your website simply copy your custom URL and link it to or on your contact or inquiries page. You can also embed your lead contact form by using the embed code that is provided for each contact form in your account once you've published it.